Four writers, including the “Catastrophe” creator, try to coax empathy and humor from motherhood’s never-ending toils, but instead create more unbearable chaos. Cringe comedy isn’t for everyone, but the best forms of it — “Curb Your Enthusiasm,” “The Comeback,” “Peep Show” — find a way to make the awkward situations their characters go through feel necessary. It helps make that discomfort relatable and cathartic for the audience. The Sundance Now acquisition “Motherland” has the perfect set-up: What’s more socially awkward than the passive aggressive, gossip-filled, and cliquey world of parenting? Though creators Sharon Horgan (“Catastrophe”), Graham Linehan (“The IT Crowd”), Helen Linehan, and Holly Walsh (“Dead Boss”) build this chaotic existence well, they also shoot themselves in the foot by making their main characters self-destructive instead of self-sustaining. They don’t survive the madness so much as they consciously perpetuate it and then complain about the problems they’ve created. 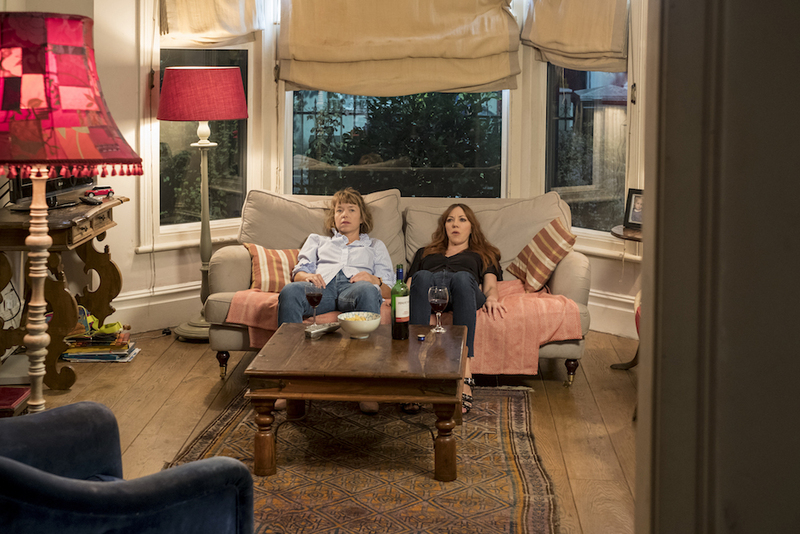 Following one working mom who’s trying to balance her professional and familial responsibilities, “Motherland” begins on a particularly panicked day when Julia (Anna Maxwell Martin) meets her fellow primary caregivers. She’s bouncing around between responsibilities (getting no help from her seldom-seen-working hubby), and ends up gathering more children throughout the day instead of finding someone to look after her own. There’s Amanda (Lucy Punch), the de facto Queen Bee of her school’s parents and an impossibly put-together person. But Julia gravitates to (/ends up with) two of the outcasts from Amanda’s hive: Liz (Diane Morgan), a single mom who finds the easiest way to do everything, and Kevin (Paul Ready), a stay-at-home dad who finds the strangest way to do everything. Liz is a breath of fresh air — a respite from the cyclical madness. She gives (as the kids used to say) zero f***s about what anyone thinks of her. When she chops her finger off in the pilot, she just hops in a cab and heads to the hospital. When she notices Amanda wiping her hands every time she touches something Liz’s family once touched, she just gets drunk and seizes an opportunity for vengeance. She’s the wild card, and “Motherland” needs more people like her. Kevin, keenly played by “The Terror Favorite” Paul Ready, is another story. So oblivious is he to the awkward, borderline-offensive fundraisers he pitches, or the false competitions he imagines, that it’s hard to feel bad when the “cool moms” push him out of their circle. He’s taxing on the audience, too. Ready tries his damnedest to keep the naive innocence in Kevin’s eyes for as long as the script demands, but it’s long past rational expectations; Kevin has to know he’s an incredible kook (to put it kindly), and yet he remains in the dark. Julia is even harder to pin down, but even more troublesome. At once abandoned by anyone who will help her and inexplicably misguided about seeking assistance on her own, Julia is both put upon and self-destructive. In the opening scene, she’s in a panic trying to drive her children to school when a strange traffic light in the middle of an empty street stops her. After waiting a bit, confusedly staring at the unnecessary impediment, she continues forward. Then a car turns into her lane and they come front-bumper to bumper just as another car pulls up behind her: She’s trapped. In this instance, and a few more like it scattered throughout the season, you feel for Julia and can even chuckle at her justifiable frustration. She did everything right, or at least tried to, and was still punished for it. But far more often she invites the problems onto herself in a way that feels forced and alienating. A running gag sees Julia harass her own mother, who’s recently decided she can’t take care of the kids anymore. Though this is a perfectly reasonable choice for an elderly woman trying to enjoy the last few years of her life, Julia doggedly condemns the kids’ grandmother whenever they cross paths. She tries to make her mom feel bad for wanting time to herself when that’s exactly what Julia is trying to find, too. There’s an irony there that could be mined for dark humor, but here it just comes off as cruel. Some of Julia’s other predicaments work better because they’re rooted in ignorance. She doesn’t know that parents are expected to stay if a party’s not labeled a “drop-off” party, and she doesn’t expect to get in the pool at a kids’ pool party. Some of that humor works, but often it results in Julia lashing out at someone without even building to that outburst. She is an absolutely desperate person, at all times. That explains some of her behavior, but doesn’t keep it from becoming exhausting. The overall experience of “Motherland” is the same. Well-intentioned and with strong ideas worth supporting — seriously, people, help out your spouses — the Sundance Now comedy (that originally aired overseas on BBC Two) can’t balance the chaos it creates with the chaos it instills in viewers. Cringe comedy can provide an outlet to pent-up frustrations, but “Motherland” mainly builds more of them. “Motherland” premieres Thursday, May 10 with the first two episodes. New episodes will be released every Thursday on Sundance Now.